One of Coney Island’s oldest Mom & Pops quietly went out of business after losing their lease due to Zamperla USA’s redevelopment of the City-owned Boardwalk. 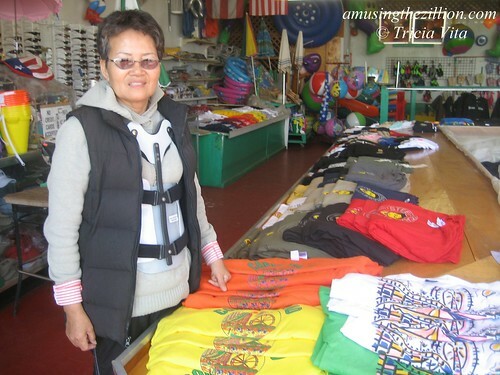 Coney Island Souvenir Shop, located next to Ruby’s Bar on the Boardwalk, was started 25 years ago by Tommy Suh. After he died last year, his wife Sue and their son Rob carried on the family business. Last week in Coney Island, work crews were busy cleaning out whatever had been left behind by the evicted Boardwalk shops. It was sad to see the familiar red-and-white sign from the Souvenir Shop about to be rolled into a dumpster. A second sign was already inside, its yellow lettering peering over the top. For as long as we’ve been coming to Coney Island, the Suh family has been rolling these signs in and out of the shop at the beginning and end of the business day. Compared to Ruby’s or Paul’s Daughter, the closing of Coney Island Souvenir and the other small businesses on the Boardwalk attracted very little media attention. In Bloomberg’s New York City, seeing a shuttered store where a longtime business was yesterday is so common that it’s not newsworthy unless the place is a local legend or the last of its kind. Even the blog Jeremiah’s Vanishing New York, which has paid tribute to hundreds of vanished places since 2007 couldn’t possibly cover them all. After looking up VNY’s first year-end tally— “Combined, we’ve seen close to 1,000 years of New York history vanish in 2007”– we didn’t have the fortitude to continue the count. A reliable way to evaluate the stability of New York City’s small business community is to examine the number of Commercial Warrants for Eviction. The majority of these warrants are issued to “holdover commercial tenants” whose leases have expired, and who can’t afford to pay the new, higher rent. The consensus of business organizations is that these warrants represent about one third of small businesses; the ones that stay and fight in court. The other two-thirds walk away without a fight.During what many consider the reign of terror for small businesses — 1986-1989, the last 4 years of Koch’s term — 17,433 warrants were issued to evict small businesses, out of approximately 53,000 total small business failures. During the last full four years under Bloomberg, 2005-2008, 27,809 warrants were issued to evict, with about 83,000 small businesses forced to close. Since the successful businessman Bloomberg took office, around 152,964 small businesses have been forced to go out of business. Keep in mind Null’s article was published in August 2009 and the stats do not cover the last three years of the Bloomberg administration. Is anyone still keeping track? To these statistics, we add six of the original Coney Island 8: Coney Island Souvenir Shop, Steve’s Grill House, Beer Island, Shoot the Freak, Cha Cha’s and Gyro Corner Clam Bar. 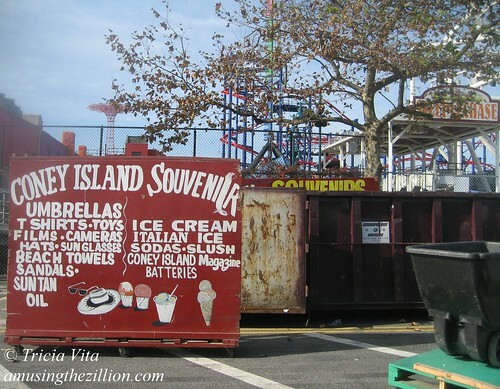 Zamperla’s policy of squeezing out Boardwalk businesses through evictions and offering ridiculously expensive lease deals is counter to the Coney Island Development Corporation’s mission of encouraging the development and retention of existing businesses. If the Coney Island 8 hadn’t fought in court and won a one-year reprieve, it’s very likely we’d have a shuttered Boardwalk and a Miami restaurateur would be bankrupt. The CI8 did the City and Zamperla a favor. Now let’s see if Ruby’s and Paul’s Daughter can afford to sign those leases that they were offered more than one month ago by CAI, operator of Zamperla’s Luna Park. Sources tell ATZ that negotiations were extended another two weeks. Nobody wants to see the last of the Boardwalk Mom & Pops join the sad statistics of small businesses forced to close during the Bloomberg administration. I hate seeing this happen – they had the best tee shirts and hooded sweatshirts in the district. Even now, living states away, I still wear my Steeplechase sleeveless tees and sweatshirt – looks like I’ll have to exercise even more care in keeping them in good shape. I’m so sad to see this place close down. Nice to hear from you, Danielle. Coney Island misses you! I miss you guys, too! :) Keeping the spirit alive and well here in TX – I thought of you at the State Fair! Love your blog as always! This is an outrage. This will be known in NYC as the age of mass extinction. get Bloomberg out NOW before he destroys ALL of new York!!! As anybody can see NYC is disappearing before our eyes. Bloomberg and his fellow magicians have managed to make some of the things that are New York simpley vanish! New York state is no longer the Empire State. It has become the Nanny State. It seems in the last ten years the people of this city have lost the ability to know what’s right or wrong for them. Magically of course. Buildings, parks, Mom & Pop businesses and whole areas have gone because they were in the way of the idea of what is good for the people and their neighborhoods. Bloomberg is right up there with Robert Moses. Oh, wait! You can now sit in the middle of Times Square and we have bike lanes everywhere. So people, get on your bikes & we’ll meet at 42nd & Times(Bloomberg/Disney)Square.